Franz and I trekked to the top of the Sulzfluh, a formidable +2800 meter peak in the Western Austrian Alps. Our route was up a non-technical, but strenuous trail. As we reached the peak, we joined the handful of others rugged individuals already resting under the 30 foot high cross monument at the pinnacle. As we stood proud of our accomplishment, three giggly Austrian teenage girls entered the scene from the back side of the mountain wearing helmets and rock climbing gear. This could only mean they ascended the more technical Klettersteig – or Via Ferrata vertical climbing route. A via ferrata (Italian for “iron road”) is a protected climbing route found in the Alps. The essence of a modern via ferrata is a steel cable which runs along the route and is periodically (every 3 to 5m) fixed to the rock. Our accomplishment was still gratifying but suddenly taken down a notch. They don’t make teenage girls like that in Encinitas, California I am thinking to myself. “I guess we’re not in Kansas anymore”. As a co-founder of Eagle Creek Travel Gear, and responsible for global business development, I’ve had many opportunities to travel around the world and when possible include personal travel/adventure into my business travel itinerary. On several occasions I had the fortune to trek in the Alps, staying in alpine huts managed by the Austrian Alpine Association. And always with my buddy Franz. This year, my daughter graduated from San Dieguito High School, in Encinitas California, and before continuing her studies at Seattle University, my wife and I wanted to take her on a celebratory adventure. Neither my wife Judy, nor my daughter Kai, had experienced European trekking. Our close family friend formerly from Encinitas, Franz Herbert, moved back to his home town in Austria along with his American wife Sharon, who happens to be a Navajo Native American. So we headed for Austria. Our first stop was to Franz and Sharon’s home in Bregenz, which is the capital city of Vorarlberg, Austria. The region is not only a cultural center but also a very prosperous business region, headquarters of world famous Red Bull energy drink, Head Skis and Milka Chocolate. Bregenz sits on the border of Austria, Germany and Switzerland, in the Rhine Valley but tucked between Lake Constance (the Bodensee) and the Pfänder Mountain. Population of 30,000, it’s quite quaint and picturesque and appears to be more of a cultural and recreational area than an obvious industrial center. Franz Herbert and family live in the house his parents built in the 60ies, and his Native American wife, Sharon, has turned the grounds into beautiful Asian gardens complete with tea house and meditative fish pond. Franz is a former ski instructor, marathon runner, first class mountaineer, and our mountain guide. 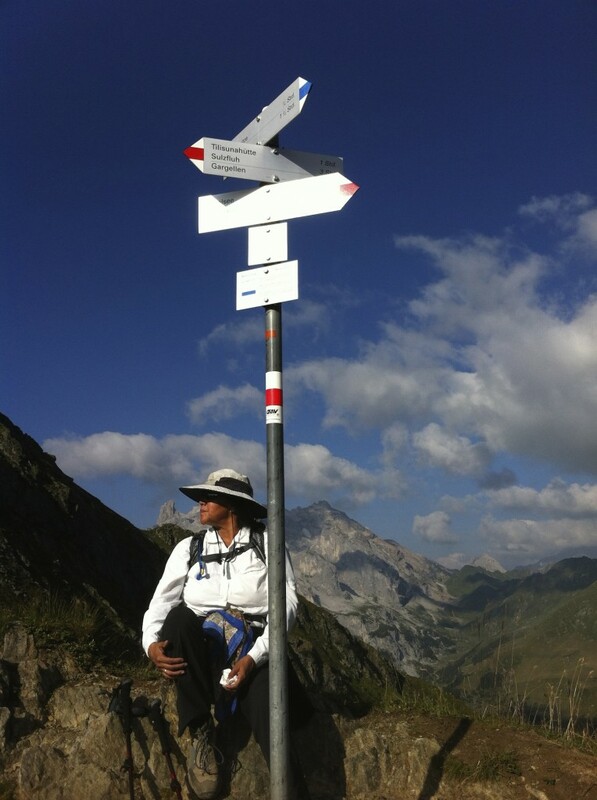 The Austrian Alps and its network of hiking trails are very accessible throughout most of the country. Public trains and buses run extensively and reliably from town to town, making day travel and tourism very easy. The people are friendly, the scenery is story book, and the food is delicious, especially washed down by the local beer and wine. The only challenge for tourism is that foreign language is somewhat limited and as in most mountain regions, the weather can be unpredictable, especially at higher elevations. Because we intended to stay in the Tilisuna Hütte in the mountains, it will provide food and shelter, making preparation and packing for this trip relatively simple. A trekker needs a comfortable pair of sturdy hiking boots, trekking poles, appropriate clothing for both warm days and cool days, cold nights, rain protective outerwear, sun screen and sun protective hat eyewear, sunscreen, a hostel sac as your personal linens, a good book for the hut and snacks for the trail. All of this should fit into a 30-40 liter rucksack, which should be only moderate carrying weight. The hut (there are 100’s of them in the Austrian alps), will provide a hot dinner, modest breakfast, hot and cold drinks and a cold shower if you are lucky. The accommodations range from sparse semi-private rooms to rustic dormitory sleeping quarters with pillows and blankets provided. Our trek started with a 30 minute train ride from downtown Bregenz, which connected to a 45 minute bus ride to one of the many small villages, Gargellen. Primarily a winter ski town, in the summer they use their gondola to shuttle tourists and hikers up to a mid point, where you can dine or start your venture off into the Alps. We took the ride up 1500 feet, stepped off to immediately hear the sound of cow bells clanging in the adjacent meadow. After a quick bite to eat at the outdoor café, everyone cinched on their rucksacks, extended their hiking poles and we started up the trail toward the first small peak. My daughter Kai, the most reluctant hiker of our bunch, actually led the way on the first ascent bolstered by the beautiful scenery, fresh air and blue sky. Reaching the first crest and initial resting stop in about 45 minutes, blisters were already started forming on my wife Judy’s heels from her relatively new hiking boots. Not a good sign for three days of strenuous hiking. We patched her up with Second Skin, a product for protecting boot rub spots and we (especially Judy) hoped for the best. The first day was long and arduous, 6 hours of uphill and downhill hiking, 13 kilometers to our hut. The trail led up along ridge tops and valley streams with some of the most breathtaking views and countryside imaginable. Mountain flowers sprinkled the high meadows, glacial peaks hung above, and dense forest below as we crossed streams and followed our trail. We spent all of the day way above the tree line, which is at approximately 1500 meters and staring at 3000 meter alpine peaks. We arrived at the Tilisuna Hütte in an alpine gorgeous meadow, capacity for about 100 hikers, but rarely full. There was not much sunlight left and not a lot of energy in reserve, so the hut was a sight for sore legs. The celebratory cold beer was particularly rewarding, though the ladies preferred the local wine. It is good practice to call for hut reservations, however their policy is to never turn away a mountain hiker, they will always find a spot shelter. We settled in a bare bones private room for 5, with hard bunk beds, simple mattresses, pillow and blanket., rest rooms down the hall. In the family style dinning hall, there were several choices of hot dinner entrees including a vegetarian meal for Judy, and of course apple strudel for dessert. We all went to sleep early and slept well, except for occasional snoring from our bunkmates. 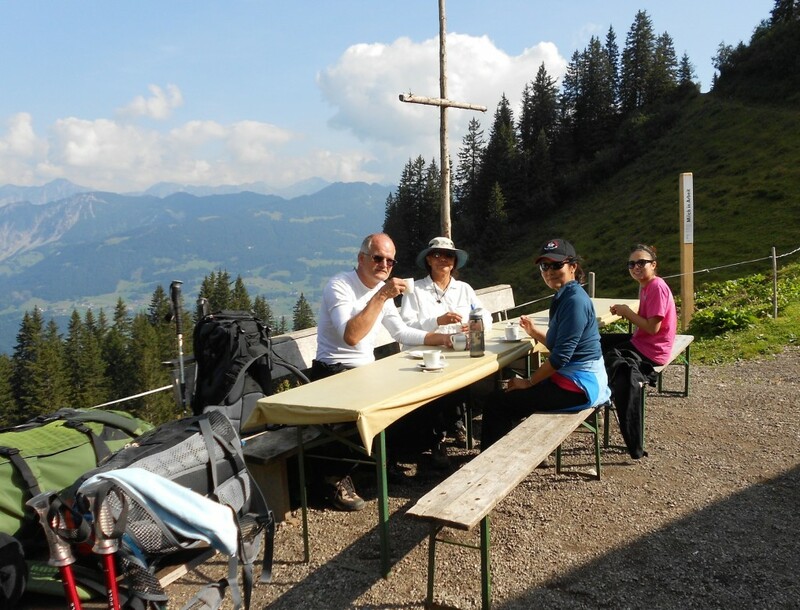 The second day, the women did casual day treks while Franz and I climbed up the Sulzfluh. It is an accessible strenuous hike from one side of the peak and a technical rock climb from the back. In the afternoon, we all enjoyed the breath taking scenery, incredible views, and relaxation at the hut. Day three was our down hiking day, on a different route to the town of Vandans, another small mountain village, with public transit back to Bregenz. The hike down was about 8 kilometers, and equally picturesque, passing glacial ponds, meadows of wild flowers, crossing mountain streams. As we got closer to civilization herds of grazing cows and donkeys greeted us. The trail led past the farmer’s house and we were served coffee and home made cheese from the farm. One more hour and we arrived in Vandans, stopped at an inn for a full meal of local fare before catching the train back to Bregenz. 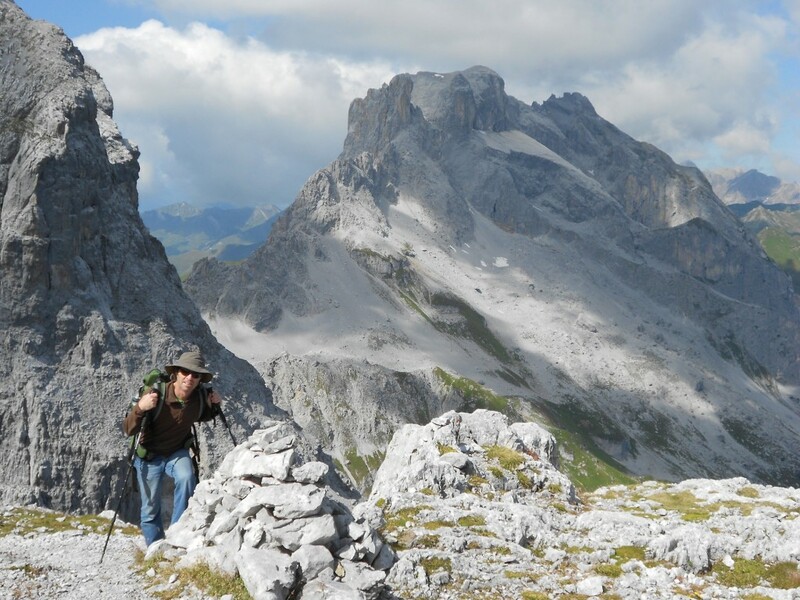 Trekking in the Alps is an exhilarating and breath taking experience. It requires you have a moderation of fitness, enjoy the outdoors, and the appropriate clothing and equipment. It is surprisingly accessible in the region, and for us foreign tourists, a guide and German speaker is helpful. I am sure that the same is true throughout the Alps of Germany, Switzerland, and Italy, but I don’t think I could ever tire of visiting this region of Austria.